Aged sheng comes at a price. You might get lucky to find a ten year old bing for 50€ (about 68US$) as described here. But usually prices in Europe are way higher. 150€ for an unspecified bing of Menghai tea from the late 1990s seems like a bargain when searching through European shops. So at long last I mustered up all my courage and ordered directly in China at Chawangshop. An meine deutschsprachigen Leser: ein muttersprachlicher Bericht ist auf TeeTalk.de erscheinen. Dies ist der Link. Browsing through their selection of aged sheng, I stumbled upon an unbelievable offer: 500g of sheng from the late 1990s for just 78US$ (about 57€). Too good to be true? Well, they offer a sample of 25g, so I decided to give it a try and included a sample in an order which was budgeted as my wife's Christmas present to me (yep - I'm the luckiest husband!). The ordered goods arrived several weeks before christmas. Of course I had to check the contents of the parcel straightaway ("No sipping, just sniffing" my wife admonished) and opened all the sample bags and the bing (more reviews coming up). When I got the first whiff from the Jin Gua sample bag, I was hooked. I just had to write something about it on TeeTalk (internet forum on tea in German, link found in the side bar). But when I published my first lines of euphoria, horrible premonitions started paining me: What if TeeTalk readers start buying up all the stock of Jin Gua? What if nothing would be left after christmas when I could try the sample? These horrors caused me to utter sounds like an injured dog. Must have been quite a severe case of whimpering, as it caused my wife to say "Okay, okay, stop whining and order a lump of that old tea." If I truly were a dog, I would have licked her face! Two weeks after that incident (still well before Christmas) a complete 500g melon of that tea arrived. So now I feel secure with a pound of aged tea waiting for March. Secure enough to write about this tea. Lets start with the dry leaves: Dark brown with hints of copper. Compression is tuocha-like: bordering on the density of diamonds. Some slender stalks are included. The dry sample omits a fragrance of antique furniture and loads of camphor. Just what I go for in aged sheng. What can be found in the cup? Quite a dark tea, but not as deep brown as I expected. Still, the russet brown speaks of Age, not mere storage. Inhaling the steam rising in lazy clouds from the cup, my nose gets the full load of 'antique drawer in which a chinese herbalist use to store his camphor' with a good dose of old leather on top. Sipping the tea, the impression of leather is much more pronounced than antique wood. But the focus of attention is unfailingly gripped by the mint. That's funny: my nose tells me that this tea must be the mold after which Tiger Balm is produced, but my tongue tells me I'm having a mouth full of fresh spearmint. At least when I brew this tea in my Zisha pot, it is mainly leather + mint ... but when I brew it in a porcellain gaiwan, my tastebuds tell me that I am drinking an infusion of antique wood and camphor. But fragrance and flavour are only part of the experience. The aftertaste and mouthfeel are even better: Right after swallowing the impression of wood or leather is gone instantly, leaving the mouth awash with mint and the cooling sensation of mint. I've never tried a mint chewing gum which gave me such a minty cooling as this tea! The cooling effect slowly seeps down my throat and seems to clear my lungs. After following that sensation for a while, a sweetness starts do develop in my mouth. But it is not easy to concentrate on that sweetness as I am distracted by a tingling feeling starting in my hands and feet then rising up. A brew such as this is just the right stuff to serve to someone who doubts you can get drunk on tea. As the tea is quite strong, I use a very light leaf/water ratio: only 3g for 100ml. When I first tried the tea I brewed it a bit stronger at perhaps 5g / 100ml. But it was way too strong - I had to dillute the brew with hot water, still it made me feel giddy and even slightly drugged. Brewing this aged tea with only 3g still yields a strong tea, if you increase steeping times accordingly. The drawback is that increased steeping times make for a reduced number of infusions. After ten infusions the leaves feel spent. Let's take a look at the spent leaves. 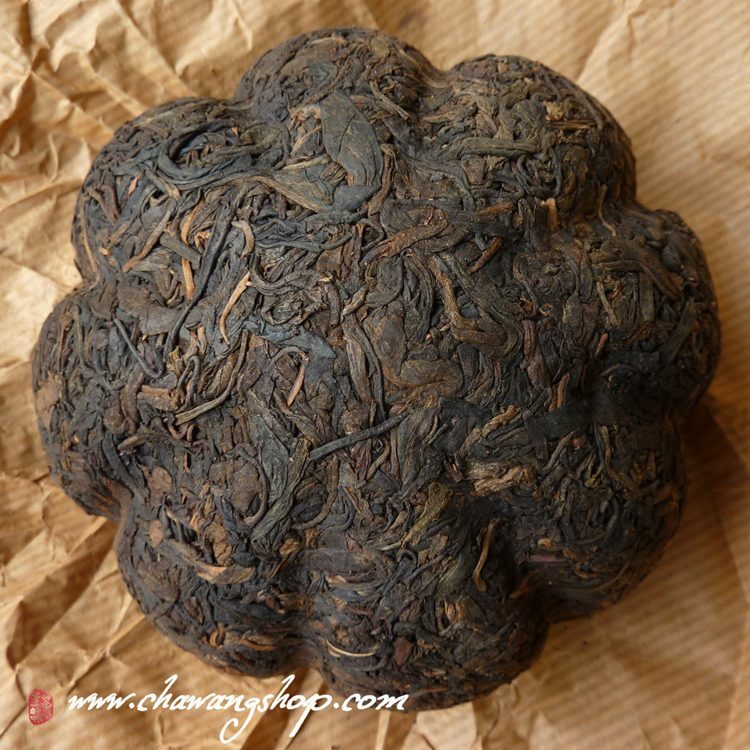 What strikes you is the clear distinction of tea types of maocha that went into the blend: the usual look of leaves which have been rolled into needle shape - and ball shaped leaves which have not yet unfurled fully and look several shades darker. This is the first time I encounter ball shaped maocha. How to evaluate this tea? On one hand there is a powerful tea exhibiting flavours and sensations I look for in aged sheng at an amazing price. On the other hand there is the fact that the leaves don't last for long, being exhausted rather early. The fact that leaves in a melon are compressed at leat as tightly as in a tuocha might explain something: high compression damages a leaf's structure, so it is easier for the water to extract flavour, coffein and other ingredients during infusion. Thus the brew gets stronger but you sooner reach the point where everything has been extracted from the leaf and the brew feels hollow. My personal conclusion is: at 57€ for 500g (which equals about 41€ or 56US$ per standard bing of 357g) this is still a great deal! Even if I can only get 10 infusions out of it, I have to consider that I use only 3g per session. You can do your own math to decide if this tea is ridiculously underpriced ... or you can just add a 25g sample of this tea to your next order at Chawangshop and find out for yourself. No - I don't get any benefits from Chawangshop for writing this review. To my knowledge they are as yet not even aware of the fact that I write this little blog. Our e-mails concerning my orders (not all tea drinkers are patient, so I can be a real nuisance while waiting for my order to arrive) were really friendly and I got the impression I was writing to new friends, not just a business acquaintance. Call me romantic, but somehow I believe that the love of tea can be a unifying factor, creating something like a fellowship of people who have never met but share the enthusiasm for watery infusion of camellia sinensis. Have you ever found ballshaped maocha? What are your experiences with melon shaped puer tea? was mich hat zweifeln lassen, war die helle Aufgussfarbe auf einem weiteren Foto. Naja, sind eventuell Vorurteile, aber ein Raster beim "Sichten" braucht man schon. Findest Du den Tee für sein Alter als "schön gereift"? der Tee ist wirklich gut greift und gealtert. Als ich beim ersten Versuch den Tee in meiner üblichen Dosierung aufgegossen habe, war er auch deutlich dunkler - fast wie ein Schwarztee aus Yunnan (Dianhong).